Anti–IL-23 treatment inhibits acute EAE. (A) Average clinical score of mice treated with 1 mg of anti–IL-23p19 (clone MB74) or anti–IL12p40 (clone C17.8) injected at day –1 and day 6 of EAE priming. One of 4 experiments is shown. Disease incidence and average disease onset of all mice are shown in Table 1. (B) Routine H&E histology of spinal cords from antibody-treated mice taken at days 30–40 of immunization. Original magnification, ×200. Representative micrographs of anti–IL-23p19 and -p40 treated groups show no inflammation in the white matter of the CNS. Rat IgG2a (rIgG2a) isotype control group shows infiltration of inflammatory cells in the lumbar region of the spinal cord. 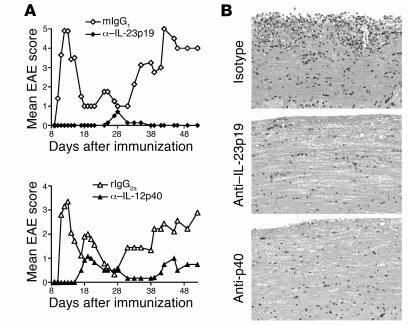 Mouse IgG1 (mIgG1) controls showed similar levels of CNS inflammatory cellular infiltration (not shown).